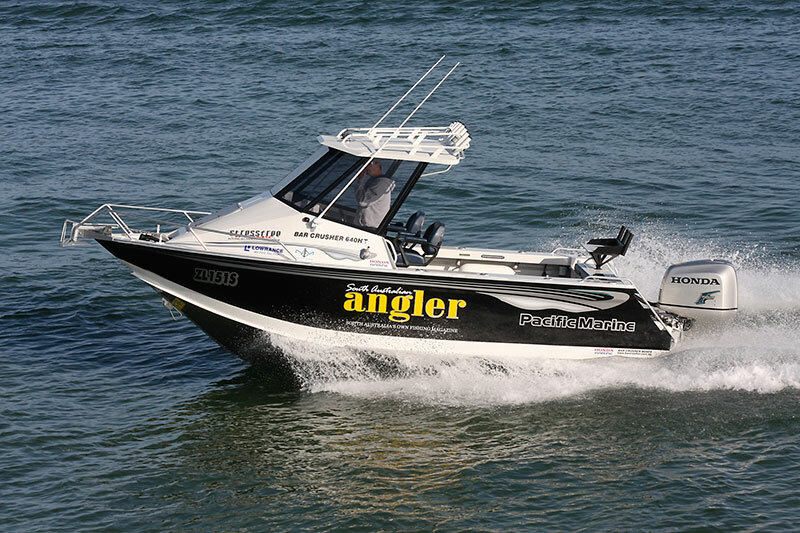 Respected outdoor journalist, author and editor Shane Mensforth has taken delivery of a new Bar Crusher 640HT, which will be his magazine’s – SA Angler – project boat for at least the next two years. Powered by a Honda BF200, fitted with Lowrance HDS electronics and packaged on an Easytow trailer, Shane said the Bar Crusher / Honda project boat was the “most ambitious and most exciting” package he’d put together in the past two decades. “I started looking for a new boat early in 2009 and did a mountain of homework before making the final decision,” he said. “With a heap of long-range work on the agenda, especially wide of Port Lincoln, we needed a rig that would take us to the offshore reefs and islands and back again – safely and economically. After testing a lot of craft in the size range and style he had in mind, Shane said he climbed onboard the Bar Crusher 640HT on a nasty day off Adelaide and knew from the outset this was the boat he needed. “Soft ride, exceptional stability at rest and super tough construction were the stand-out features and, as far as a powerplant was concerned, the Honda BF200 was the obvious choice,” he said.